Chocolate Hazelnut Granola – Healthy, crispy granola that will remind you of your favorite childhood chocolate cereal and even turn milk into chocolate milk! Despite all my efforts to be relatively health-conscious, I have resigned myself to the fact that I have a huge weakness for crunchy, sugary cereal. It is my closet food guilty pleasure! And don’t even get me started on Rice Krispies Treats. I attribute most of my “freshman 15” to an always-present bag of cocoa kripies in my dorm room. I kind of cringe to even admit that now! Let’s be honest, healthy living was the last thing on my mind in college. Which is ironic because I studied food science/nutrition. It’s all about keeping it real, right? These days I hardly eat cold cereal for breakfast anymore, let alone allow myself to buy the sugary cereals of my younger days. 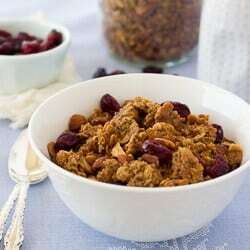 But after tasting one bite of this granola, I was taken back to the world of cocoa puffs and krispies. 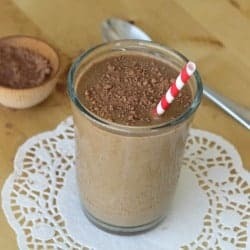 It even turned my almond milk into chocolate almond milk! It is the truly delicious, but full of wholesome ingredients. This granola is lightly sweetened with unrefined sugar. If you can find them, be sure the include the buckwheat groats. They really add the puffed crispiness that reminds me of my old favorite cereals! 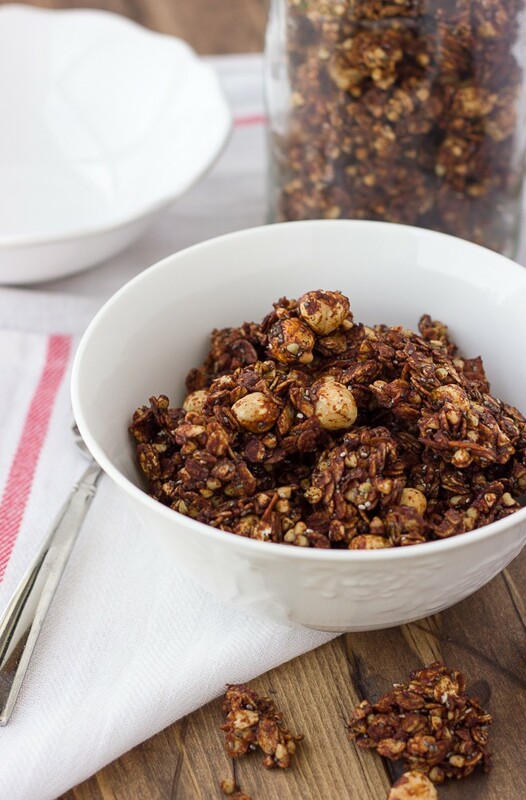 This granola would also make a great food gift. 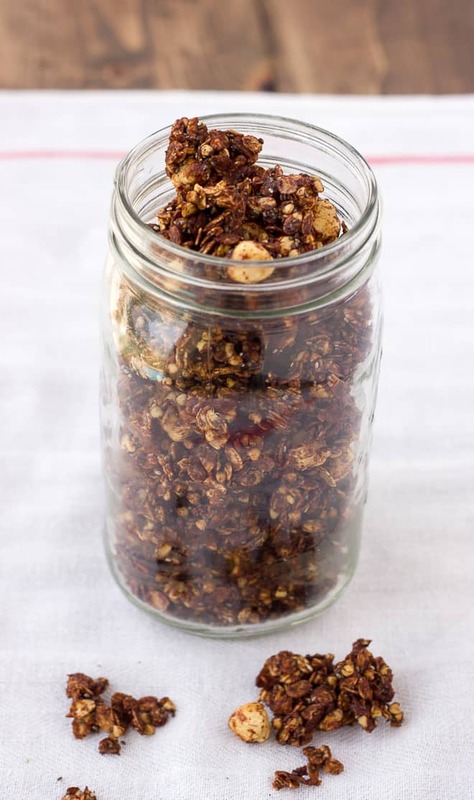 Granola is such an easy thing to put in jars and giveaway, and this granola is extra-special! Is there anything better than the chocolate hazelnut combination? Homemade granola is also surprisingly simple to make. I promise if you make this once and taste how delicious it is, you will never go back to processed cereal again! In a large bowl, combine the oats, buckwheat, coconut, hazelnuts, and chia seeds. In a small saucepan, combine the honey, coconut sugar, coconut oil, vanilla, salt, and cacao powder. Heat over medium until the mixture is smooth and fully combined. Pour the chocolate mixture over the dry ingredients and stir to evenly combine. Spread the granola out onto the baking sheet in an even layer. Bake for 15-20 minutes. Remove from the oven and flip over large sections of the granola to cook on the other side. Bake for another 10 minutes, stirring every 3-4 minutes until the mixture is toasted. Allow the granola to cool. Store in an airtight container at room temperature for up to 2 weeks. Enjoy! 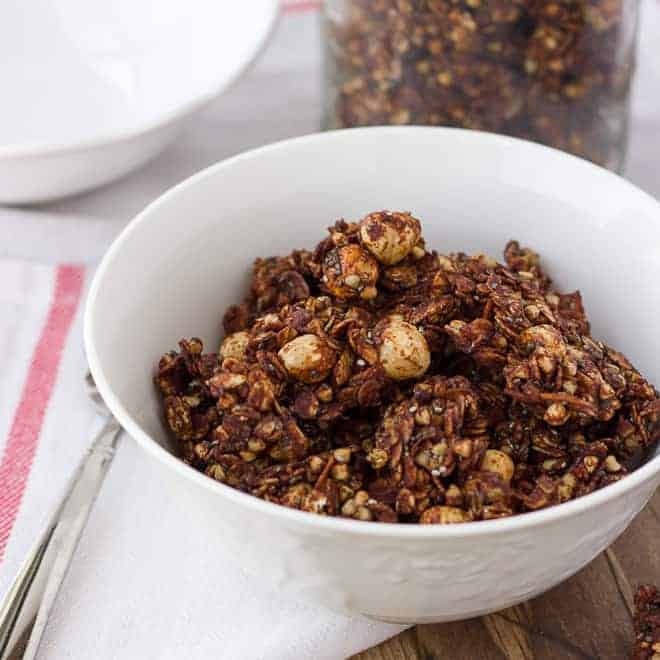 *To make this more decadent, you could add a handful of mini chocolate chips to the granola after it has cool. Freeze-dried strawberries are also a delicious addition! *I highly recommend using the buckwheat groats because of their puffed crispiness. But if you can’t find them, just substitute with an additional cup of oats. Check out this recipe from Vegetarian Mama on how to make the perfect homemade dairy-free parfait! Nutella flavors + granola form = sold. Thanks for this recipe. I can’t wait to bring some variety back into my very boring breakfast routine! I couldn’t wait… I stopped at the store for buckwheat groats and coconut today and baked this tonight. 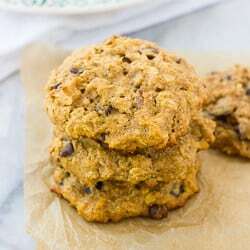 I LIVE off of this recipe! The hazelnut and the chocolate is a perfect combo!